Identify optimum levels of inventory within a pharmacy to ensure usage. With pharmacy management review the levels of inventory in remote locations such as emergency carts to determine the proper quantity of products in each location. Identifying the proper levels of inventory will significantly reduce the lost inventory value of expired products that fail to qualify for a manufacturer’s credit, a significant and recurring loss. Products may not be stored with a real-time inventory. Reverse distributor personnel have access to Class II product without supervision or inventory reconciliation. The destruction of Class II drugs by reverse distributors have very little or no oversight by the DEA. The destruction of Class II drugs by reverse distributors has very little or no oversight by the DEA. Only a bureaucrat at the DEA would believe that listing of opioids on a DEA Form 41 is oversight. Unlike the past, manufacturers of opioids are now auditing reverse distributors in an attempt to prevent diversion. The leading reasons for the denial of a credit by manufacturer policies; not accepting partials SKUs for credit, followed by product exceptions and past the date limitation for the return of expired products. From this information, Cost Control Solutions will provide the customer a product analysis identifying the One, Two and Three Week PICS. The analysis will be presented in the following format. 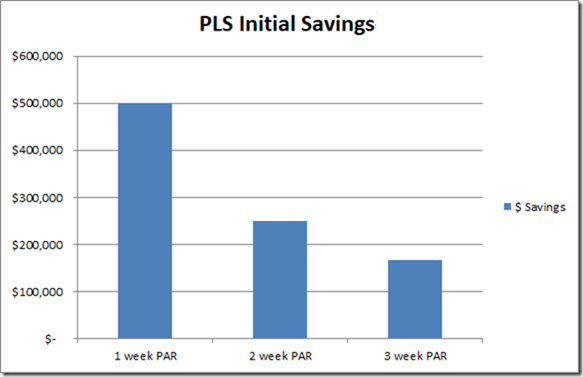 Also provided will be a chart showing the estimated reduction, or better stated, the savings by reducing the on hand inventory to a One, Two or Three Week Inventory Level. The saving is based on a comparison of the inventory value from the Closing Inventory with that of the Pharmaceutical Inventory Control Service inventory values.